If your opponent controls a Link Monster, you can Special Summon this card (from your hand). You can only Special Summon “Gateway Dragon” once per turn this way. Once per turn: You can Special Summon 1 Level 4 or lower DARK Dragon monster from your hand. Gateway Dragon is a splashable monster of sorts. Decent stats and support, its attraction is its Special Summon effect. Your opponent has a Link Monster? You get a free Special Summon with Gateway Dragon. If you’re running this card alongside some Level 4 or lower DARK Dragon monsters you can Special Summon one of those from the hand. I like the Special Summon effect, Link Monsters being a necessity in most deck strategies now. It’s a free Link 1, or can set up bigger plays. There are monsters you can Special Summon though regardless of what monster(s) your opponent has. This monster you can’t get the most of unless you run some DARK Dragon monsters to pair with its second effect. Gateway Dragon is a solid example of average. It’s a Level 4 Dark Dragon-type monster with 1600 Atk and 1400 Def. The stats are fine and it Special Summons itself if your opponent controls a Link Monster. You don’t need to have an empty field to Special Summon Gateway Dragon, which is really good. If your opponent isn’t playing Links, you can Normal Summon it and still use the second effect. Once per turn, you can Special Summon a Level 4 or lower Dark Dragon-type monster from your hand. Free Special Summons are good, and Gateway Dragon has two, one for itself and one for each turn if you have the right stuff in your hand. There are no restrictions on the new monster’s name, so you could get another Gateway Dragon and use the effect again. As good as Gateway Dragon is, it’s only truly as good as the combo you start after it goes off. Since those are many, this will score well. The 3 copies are easy to side out if you’re only using it as an engine. Score: 3/5 Art: 4.5/5 I’d love to see this monster evolve. A new week ahead of us and we continue to dive into the Circuit Break set. On the plate today is a card meant to extend your plays in Link Format for most Dragon decks, Gateway Dragon. 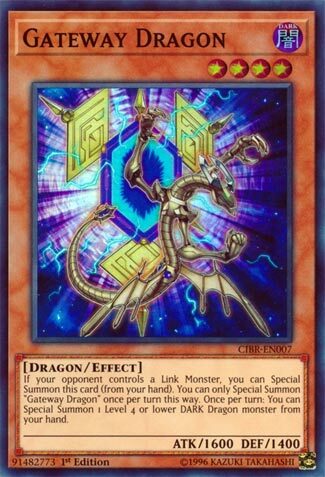 Gateway Dragon has the ability to Special Summon himself from the hand if your opponent controls a Link Monster, but you can only summon Gateway Dragon once per turn this way. Not only that, but Gateway Dragon can summon a Level 4 or lower Dark Dragon from the hand. If you are going second and your opponent Link Summoned, this can be an immediate Link-2 without using the Normal Summon. However, as far as I know, there is no real generic Link-2 that points Bottom with both arrows, and no Link-2 to summon with 2 Dark Monsters yet. Twin Triangle Dragon is possible, but it has arrows pointing Right and Bottom I believe, but it can summon a high level monster from the grave if you have one, so Decode Talker is an immediate option. In the Rokket deck, this can help you get to Borreload Dragon faster, which seems to be the boss monster for that deck as it can trigger the Rokket monsters. Gateway Dragon is a good card, but the Link pool currently needs more setup than Gateway and a Dark Dragon. The card is good and gets better with more Links to have as an option. Worth playing in the Rokket deck, still. We open the week with a simple, combo oriented card, for the Dragon player, in Gateway Dragon. Appropriately named, as this card can gateway, or combo, into certain Special Summoning aspects with relative ease. Dark, Dragon, 1600 attack, Level 4 all make for a decent enough card. Can Special Summon itself from the Hand if your opponent controls a Link Monster. Once a turn, you’re granted the ability to Special Summon one Level 4 or lower Dark Dragon Monster from your Hand. Same Level can lead to XYZ, you’re open to a Link 1 at the very least also, so those are good things. The 1600 attack is decent enough, though being restrained to what you have in your Hand slows this card down a bit.